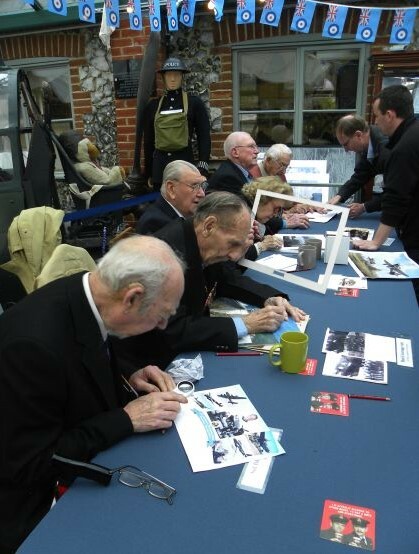 To help officially kick-start the 2014 season, the Museum was pleased to welcome several star guests on Easter Sunday. Jim Davidson OBE, one of Britain’s top stand-up comedians, well known TV game show host and recent winner of ‘Celebrity Big Brother’ visited the Museum to lend his support and he mixed with visitors and took a good look around the Museum. The other stars of the show were our visiting RAF veterans Harry Irons DFC, Joe Cook, Sid Beaver DFM, Ron Liversage MBE, Jack Christianson, Rodney Scrase DFC and Denise Edwards née Franck of the Belgian Resistance. 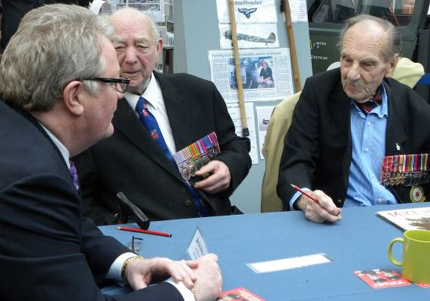 Even though the weather tried to ruin the day with some ferocious downpours, it didn’t stop visitors from getting to meet their heroes and a good day was had by all with a good sum raised, whereby Harry Irons was presented with a cheque towards the RAF Bomber Command Memorial maintenance fund, so thank you to everyone who supported this event. You are currently browsing the Shoreham Aircraft Museum – News archives for April, 2014.